The Wacky Watercooler April Blog Hop: April Fool’s is still waiting around the corner! We’re an international crew so don’t be surprised if you see a few different spellings and price guides along the way. Links to Catalogs will vary by country as well. How ever you are viewing the hop, we’ve built it in a circle so you can join and hop on and off at will. If you get lost just click the hop banner or the home watercooler button to get back to our hop home site with the list of participants. You may want to keep an eye on that site in between blog hops as we are trying to post members without blogs projects there somewhat regularly as well. If you are moving in hop order you’ve arrived from the very talented Marie Green. I love the title of her blog it just makes me want to settle in for some crafting in a cozy atmosphere! If you are working in reverse order weren’t your socks knocked off by Kath’s wonderful projects? Another dear friend I discovered through stamping and hers is another blog to investigate after the hop for sure. Mother Nature is a tad confused about what season it is. We’ve alternated between spring temps and lilacs in bloom and hard frosts and sleet! Just a bit higher up the hill from me there has even be snow! So that was my starting point for something that isn’t what it is supposed to be (our directions from hop master Heidi). A Spring card…that isn’t quite that! Notice the dual or dueling embossing folders. One with snowflakes and one with spring flowers. And the greeting that’s edged in black. Not sure if I’m mourning the loss of winter or the almost missing spring. This one is almost as wacky in it’s own way and I have a couple of people to thank. 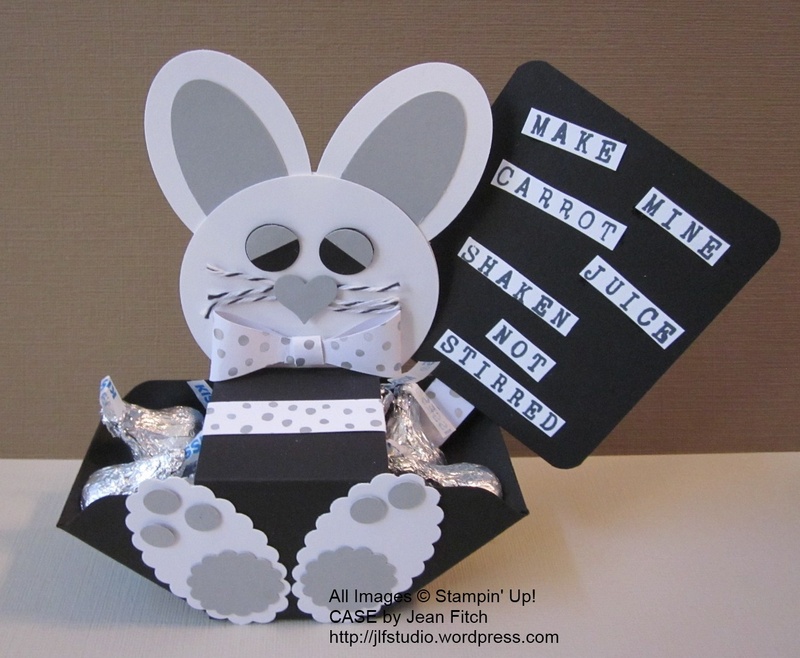 Linda Parker who created the idea of a bunny box and kindly shared her project how to’s in a video. And my friend and fellow Wacky Watercooler bud Patti Leeke for suggesting the Bond theme for the Tuxedo Bunny…she also insisted on the cummerbund to match my bow tie idea. This one’s for you Miss Patti! Yep…that James Bond! Ahem…that’s why the kisses are in the box/basket…not sure which one of the silver screen Bond’s I most want to kiss…I rather think there are several! LOL Of course Sean Connery will always be first in my heart! Punches: Extra Large Oval (formerly Wide Oval), Large Oval, 2-1/2″ Circle, 1/2″ Circle, Scalloped Oval, 7/8″ Scalloped Circle, Owl Builder (small circles on feet), Bow Builder, Corner Rounder, Small heart from Itty Bitty Accents punch pak. Other: Envelope Punch Board, Paper Snips scissors, Black Baker’s Twine. If you’d like to make your own here’s the link to fellow demo Linda Parker’s excellent video tutorial. She’s a demo in the United Kingdom. As far as I can tell she’s the originator of this design. 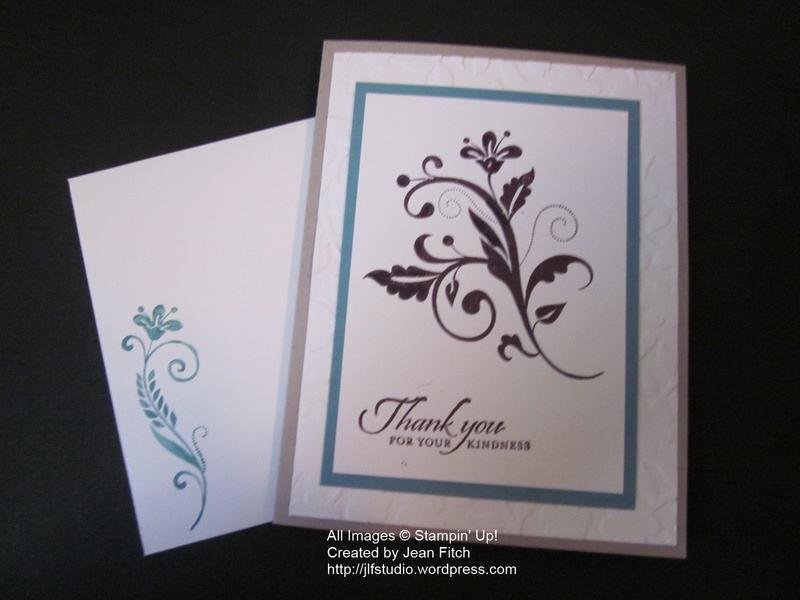 Thank you Linda for sharing your most excellent project and generous free tutorial. Now for a more serious (and seriously cool) project. Nothing wacky about this one at all, except possibly the name of the stamp set. Try typing flowering and flourishes and spell them correctly the first time when the words are right next to each other! I wonder if Stampin’ Up was having their own wacky day when they named this fabulous stamp set? Last Tuesday I followed along on a very fun Livestream class (free) from Glenda Calkins another fellow Stampin’ Up demonstrator. I was so enchanted with Glenda’s Book Box Card Box I had to make one of my own. The box holds 8 (or so) cards and envelopes and once you get the steps down it’s not to hard. I see I forgot to show an open picture of the box holder. Sigh…something else to add to the to do list for another day. That’s it for my post for this April Fool’s Watercooler Hop. Hop along now to see the fabulous and talented Kath and the rest of the holiday hop entries and look for our Wacky Watercooler crew every month as we create more new hops for your viewing and crafting pleasure. Click the appropriate watercooler buttons to find your way. And if you would like to view past hops…check out our hop home page and scroll to see links to other hops and hoppers. Always a creative treat!